Today I was lucky enough to see Joe Cross speak about Juice Fasting at Jamie Oliver’s Food Revolution event in Melbourne. Joe is an inspiring man who walks the talk. 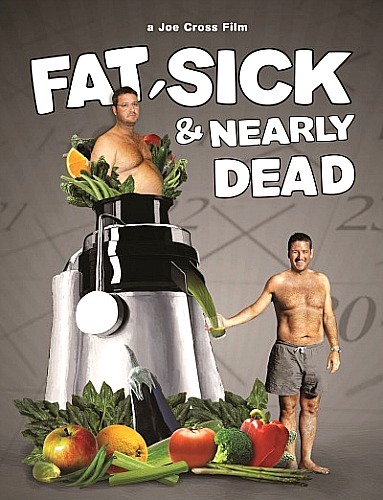 If you have not seen FAT SICK & NEARLY DEAD yet I recommend that you watch it. You can buy it from Woolworth’s or online. Joe juice fasted for 60 days to rid himself of disease and medication, travelling around America spreading the word. He speaks a lot about processed food and how the nutrients are almost non-existent in processed packaged food. We are eating high amounts of energy and little nutrients causing us to store the energy not used as fat that then clogs our arteries and builds up toxins in the body making us sick and die at a young age. By drinking freshly squeezed juice you are getting the greatest amount of nutrients per calorie. When your body is packed with nutrients, your body is then satisfied and feels full. That is why when we eat take away food and highly packaged food we are not satisfied and want to eat more and more and never seem to get full. Our cells are starved of nutrients although you ate a large amount of calories. It really doesn’t matter if you are fat or thin you could still be extremely unhealthy and thin, everyone’s body works differently. The main concern is the health of your insides. If you are feeding your body with food that has little to no nutrients your health is going to suffer no matter what. When you feed your body with natural living enzymes (plant foods) your body will thrive and allow you to have more energy, you will lose weight and your health will undoubtedly improve. Packaged food is an addiction much like cigarettes and coffee. It is not easy to stop eating food that you are addicted to and crave. Juice fasting is one of the best ways to rid yourself of addiction and cravings because your body is so full of nutrients all the time. When your body becomes in tune during fasting, you can then read your hunger as being nutrient deprived. The only reason we get cravings is because our cells are craving nutrients and we miss read it as cravings for food in general, usually packaged fast foods. If you watch the documentary it will make so much sense and may inspire you to trying a juice fast yourself. I would like to express my admiration for your kind-heartedness giving support to folks that should have assistance with this particular area. Your real commitment to getting the solution around came to be incredibly significant and have without exception enabled people like me to reach their pursuits. Your new useful report implies a lot a person like me and still more to my mates. Thanks a lot; from all of us.